We’ve put together a list of helpful tips to keep your food safe on your holidays! Always make sure food is cooked properly and to the right temperature. Food should be piping hot all the way through before serving. None of the meat should be pink; check this by cutting open a sample of the meat. Looks can be deceiving! Even if it looks cooked on the outside the inside may still be pink. Don’t be too eager! Make sure the BBQ flames have died down naturally and the charcoal is hot enough; the charcoal should be a grey-white colour. Do not cook frozen food on a BBQ, ensure that it is thawed safely and in a timely manner. Make sure raw food is stored separately from ready to eat foods. Wrap raw food in air tights bags or containers to avoid ‘juice’ dripping onto other foods. Keep cold foods cold! Pack your refrigerated foods straight into a cool bag or box, use ice blocks (last longer than cubes) to keep cold and store in a shaded area. Don’t forget to wash your hands! Use sanitizer gel, these can be bought in handy bottles, or soap and hot water. Don’t forget to pack the essentials! Pasta, Cereals, Cooking Oil, Condiments, Bread, Tinned Foods, Butter, Spreads (Jam, paste etc. ), Fruit Squash, Instant noodles, Hot Drinks, Bottled Water. Remember carbon monoxide kills! Never take a BBQ into your tent, awning caravan or motorhome. 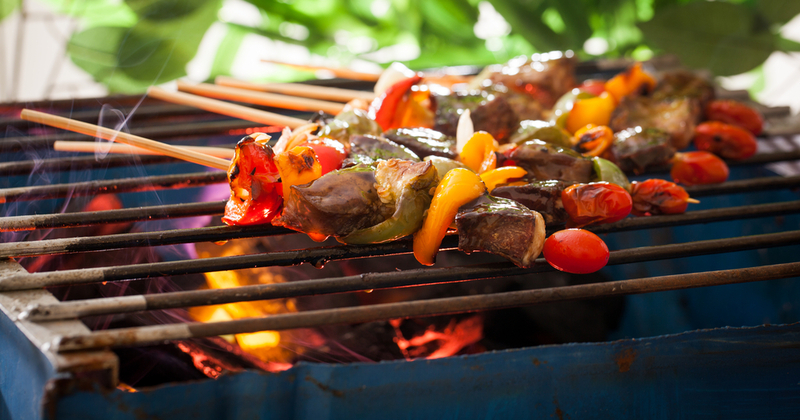 Even a cooling BBQ gives of Carbon monoxide so do not use one to heat your tent no matter how cold it is!